International restaurateurs, Hakkasan Group and hospitality pioneers, The Crystal Group have come together to develop a new hybrid lifestyle concept; Sake No Hana Dubai by Crystal. This lifestyle destination created by The Crystal Group and Hakkasan Group is known for its unique, traditional Japanese cuisine combined with its modern bar and lounge. This kind of collaboration is the first of it’s kind in the UAE, bringing together two of the best in their field of expertise to create a high-end lifestyle destination that blends traditional cuisine with a modern atmosphere. Located on the ground floor of downtown’s Souk Al Bahar, the 12,500ft location will be on two levels with views of the BurjKhalifa and downtown Dubai. 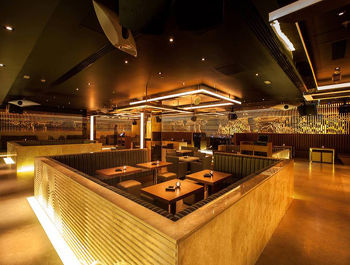 Karma Kafe Dubai -Restaurant/SushiBar/Lounge-is the exclusive new concept of Raymond Visan,the creator of the internationally renowned Buddha-Ban with its opulent decor and striking rich ambiance, Karma Kafe creates a monumental setting that is distinctive from other restaurants in Dubai. Margaux Restaurant & Lounge, a new-look hot spot for Dubai's high-flying executives and fashionistas, is the perfect venue to relax and socialize over delicious tapas and mouth-watering cocktails overlooking the spectacular views of the Dubai Fountain.. Located in the Souk Al Bahar, Old Town Burj Dubai. In keeping with its global trendsetting status, The Meat Co has spared no expense in creating this spectacular restaurant.The décor of The Meat Co Burj Dubai includes lavish design features and textures. Located at the entrance to Souk al Bahar, Urbano is a convenient stop for tired shoppers coming out of Dubai Mall. The interior is modern and spacious, with an open kitchen, but the best reason to come here is to enjoy the spectacular views of Burj Dubai from the terrace. Zahr el-laymoun is a down to earth,homely and cozy restaurant environment with a moedern edge.every deatl has been carefully selected to bring a home like atmosphere.the restaurant's inviting charm combines treditional,basic materials and accessories with mordern techniques designed to appel to young and old alike. Left Bank is a sophisticated contemporary lounge, bar and restaurant. A trendy meeting place that combines style with a relaxed atmosphere, Left Bank is known for its creative casual dining menu and for pouring the best cocktails in town. Located in the heart of Dubai, in the exclusive Souk Al Bahar, Downtown Burj Dubai, Mango Tree offers authentic Thai Cuisine and a genuine charm that gives you an unforgettable experience..
Rivington Grill, in Downtown Dubai, serves a broad, seasonal menu offering the finest dishes made with locally-sourced ingredients..
Souk Al Bahar is an Arabesque shopping mall and entertainment destination located in the heart of the prestigious Downtown Dubai, on the Old Town Island. Souk Al Bahar features over 100 shops in an eclectic retail mix that includes 22 restaurants, cafés and lounges framing the souk’s extensive waterfront promenade. Souk Al Bahar (‘market of the sailor’) derives its name from both its traditional souk architecture of natural stone corridors, high archways and subdued lighting and its unique ‘sea-side’ location on an island in the Burj lake. The cultural theme flows throughout the mall, with boutique shops showcasing the Arabian heritage through a mix of authentic handicrafts, fashionwear, perfumes, carpets and furnishings.